Dr. J. Reid Parrott, Jr.
Dr. J. Reid Parrott, Jr., a Craven County North Carolina native, has made an indelible mark on North Carolina education, particularly on its community college system. He began his career in Education in 1960 as public school teacher and taught in the Wayne County, Lenoir County, and Kinston City School Systems. He quickly moved up from a social studies teacher to assistant principal and served in that capacity until 1969. That year Parrott was selected to participate in a Community College Internship Program. Dr. Parrott’s professional career in the N.C. Community College System began at Lenoir Community College where he served in positions of increasing responsible. Upon completion of his doctorate in 1971, Dr. Parrott joined the NC Department of Community Colleges. Again he rose rapidly thru the ranks. Under Dr. Parrott’s leadership, curriculum standards were developed and implemented throughout the System’s 58 colleges AND state and regional accreditation was attained by all 58. Services to our state’s new and expanding industries flourished. Efforts to eliminate illiteracy among adults were expanded. Enrollment in the system grew from 300,000 to over half a million students. Five technical institutes were converted to community colleges, and four new colleges were added. In 1980 Dr. Parrott was selected to be the second president of Nash Technical Institute in Rocky Mount. During his 20 years with the college he helped shape it into a prominent educational force and a draw for major industry. In 1999 Dr. Parrott retired from the college. 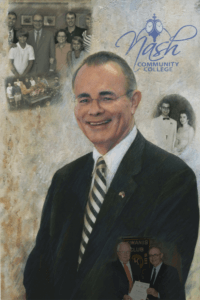 In recognition of his distinguished career in education NCC Board of Trustees honored him with the title President Emeritus and, in 2008, Nash Community College’s most prestigious award, the President’s Cup . Other significant honors bestowed on Dr. Parrott include NC State University’s I.E. Ready Distinguished Alumnus Award in recognition of his exemplary leadership and excellence in community college education. In 2015 Dr. Parrot received North Carolina’s most prestigious award, the Order of The Long Leaf Pine. The proud parents of two sons, Dr. Parrott and his wife Margaret reside in Rocky Mount. He remains an active member of the Rocky Mount Kiwanis Club and the First United Church of Rocky Mount.